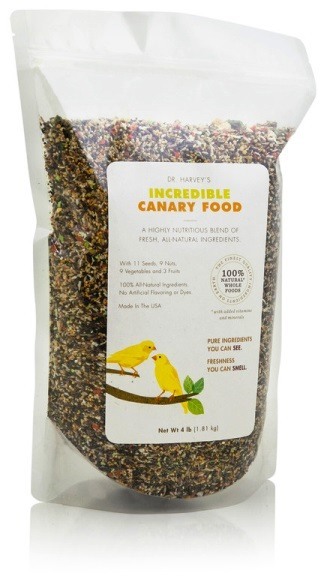 Dr. Harvey's Incredible Canary Food is the perfect blend of nuts, seeds, fruits, vegetables, herbs and bee pollen. This mix provides optimal nutrition for all canaries. As with all of Dr. Harvey's Avian Blends, this blend is made with only all-natural and 100% human grade ingredients. We do not use dyes or coloring agents and there is no added salt, sugar or chemicals that could be harmful to your birds. We grind all of our ingredients to be size specific and never use seconds or "pet grade" ingredients in any of our products. Canaries love this mix and because the ingredients make this food so plentiful in vitamins and minerals you never have to worry about your bird's diet again. Incredible Canary Food takes the guesswork out of feeding your canary. You can enjoy your bird and feel secure in the fact that you are feeding the very best food available.